The highly anticipated Inspector Morse prequel, ‘Endeavour’ returns to ITV this Sunday, with the first of four 120-minute long episodes all written by Russell Lewis, the show’s creator – based on the character created by Colin Dexter – it follows the investigations of a young Endeavour Morse in the early days of his career as a police detective in picturesque 1960s’ Oxford. Returning as Morse is Shaun Evans (The Last Weekend, Silk), who won over both critics and viewers alike with his portrayal in the pilot episode which aired in January 2012. Also returning in the role of Morse’s senior partner and mentor, Detective Inspector Fred Thursday, is renowned stage and screen actor Roger Allam (Parade’s End, The Thick of It). The series introduces new regulars Sean Rigby as a young Police Constable Jim Strange, Jack Laskey (Sherlock Holmes: A Game of Shadows) as DS Peter Jakes and Anton Lesser (The Hour, Garrow’s Law) as Chief Superintendent Reginald Bright. Abigail Thaw is reprises her role as Dorothea Frazil. At a screening earlier this week, I caught sight of the first episode, ‘Girl’, produced by Mammoth Screen’s Dan McCulloch. It picks up where the pilot episode left off and finds newly appointed DC Endeavour Morse investigating the death of a young secretarial student from an apparent heart attack. Naturally intuitive, the detective believes there is more to the case and begins his own unorthodox investigation. It’s not long before the body count rises and with an obsessive curiosity, DC Endeavour ruffles a few feathers by not keeping his ‘head down and his nose clean’ and quickly gets in trouble with the new chief superintendent who threatens to, and eventually does, relegate him to ‘general duties’ despite his champion, DI Fred Thursday. Humiliated and humbled, Endeavour has to investigate from the sidelines. Through a puzzling haze of deceit and misdirection, involving an Oxford physicist who worked on the atomic bomb and the fate of a vulnerable single mother, Endeavour is forced to question Thursday’s orders. This first outing doesn’t disappoint with a suitably complicated mystery, references to Morse and indeed to the pilot. With small character touches that foretell John Thaw‘s older Morse, the younger Morse is as dishevelled as the older Morse, arriving at work on his first day post-promotion tardy and in an un-ironed shirt which DI Thursday pulls him up on, such as a parent might admonish a child. There’s a nod to the young Endeavours’ love of Italian opera and, continuing from the pilot, his infatuation with the sounds of soprano Rosalind Calloway (Flora Montgomery). And he now drinks a glass of ale without needing persuasion, a marked departure from the allegedly teetotal Endeavour who we met at the outset of the pilot. The Oxford backdrop features beautifully and the attention to the detail of the decade with its styling, social manners and practices was refreshing enough to distract from the compelling plot twists. Anton Lesser delivers an accomplished performance as Chief Superintendent Bright. On more than one occasion he could not contain his shock and disapproval for what, back in 1965, would have been considered shocking language and deviant behaviour, leading to unexpected laugh out loud moments, in keeping with naturally comedic delivery from Sean Rigby as PC Jim Strange. I can’t say I watched many episodes of the original Morse series but I can say that Endeavour adds up to poetry courtesy of Russell Lewis and a must-record note to self. 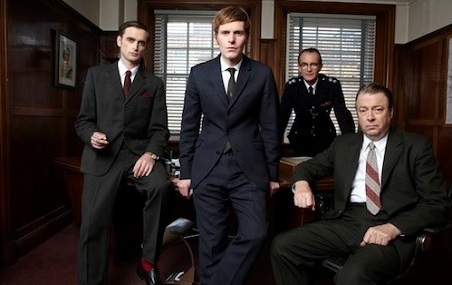 ‘Endeavour’ begins on Sunday, 14th April at 8.00pm on ITV.